Japan has its own version of Yahoo! Answers, the question and answer site where you can ask anything and receive a quick reply from other users. The Japanese site is named Yahoo! Chiebukuro (“Yahoo! brains” or, more literally, “knowledge bag”), and as this collection of the best Q&A sets shows, the questions people ask range from the bafflingly inane to the unexpectedly profound! As we’re about to see, Japan has its fair share of loveable idiots as well as geniuses! In Japanese, as in English, you can use the word “google” as a verb, as in “I googled it” or “why don’t you just google it?”, which we think you’ll agree sounds much better than the rather clunky-sounding “do an internet search” that Google’s competitors would likely prefer we said. It’s often possible in Japanese to make a noun into a verb by throwing -ru on the end of it. So jiko (事故) means “accident”, and jikoru (事故る) means to have an accident; daburu (ダブる), to coincide or duplicate; saboru (サボる) to play truant. Google, or guuguru in Japanese, therefore already sounds like a verb. As we’re sure you probably guessed, the questioner here wants to know how to perform a search on Yahoo. It’s worth pointing out that Japan is one of the few countries where Google has yet to destroy all search engine competition. Answerers were generally very supportive, patiently explaining that although we use the word “google” as a verb, it comes from Google’s name, and can’t really be used to mean searching on another site. Nevertheless, this Yahoo! Answer seems to have tickled Japan’s funny bone, racking up over 200,000 page views to date. Being the nation of bath-lovers that they are, the Japanese have a special word for “half-body bathing” – hanshinyoku (半身浴), also known as not filling the bath up all the way. ▼ Or, as in this example, filling the bath up all the way but then choosing to sit on a tiny stool instead. It turns out that this questioner has misheard the line ureshikute ureshikute, (“happy, happy”) as the English words “fresh good day, fresh good day”! We listened to the song and it really does sound like “FRESH GOOD DAY”! The next question is: why did they need to ask, when the title of the song (“kotoba ni dekinai”) is contained in the line they can remember? Come on guys, seriously, google it on yahoo if you’re not sure! We reckon this one is probably a deliberate joke, but it’s so cute we wanted to share it anyway! A nice little pun based on the pronunciation of hiyashi chūka (冷やし中華) meaning “chilled noodles”, and hiyashichū (冷やし中) “chilling now” followed by the Japanese question marker “ka“. Hiyashi chūka (冷やし中華) is a delicious Japanese dish consisting of cold ramen noodles and a vinegary sauce. Hiyashi is “chilled” and the second word chūka (中華) means “Chinese”. If we were to write hiyashichū ka as 冷やし中か instead, though, we get “are they being chilled now?” A groan-worthy joke for noodle (and pun)-loving dads everywhere. ▼ Hiyashi chūka (chuckling joke-teller not pictured). In Japan, half loaves of sliced bread (shokupan) come in regular-sized packets, but with varying thicknesses. Instead of choosing “thick-sliced” or “thin-sliced”, though, the package is labelled with the number of slices in it. So you can choose between four chunky slices or eight finely cut slices, for example. 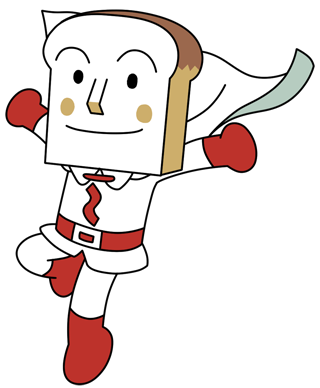 ▼ Japanese sliced bread – the best thing since Anpanman. Debate raged on this question without reaching any kind of consensus. Is Shokupanman from a four, five, six, or eight-slice bag? You decide! The answerer points out that Shokupanman is nimaime (二枚目). Ni means “two”, mai (枚) is a counter for flat objects (like slices of bread!) and me (目) is an ordinal suffix that turns “two” into “second” (just like the English “-st” “-nd” or “-th”). Nimaime, therefore, means “the second thing”, or in this case, “the second slice”. But nimaime also means a hot guy…which of course we hope you’ll agree Shokupanman is too! Hottoku (放っとく) means to leave something as it is. Pancakes, meanwhile are called “hotto keeki“. So it only stands to reason that cakes which have been left to go cold are not hot cakes but hottoita cakes! As we can see, many of these popular posts and replies are riddled with puns and wordplay. This is partly because Japanese is a comparatively homophonous language, having many identical sounding words with different meanings. And partly because the internet is a weird, perplexing, hilarious place where you can tell your best cringe-worthy joke in relative anonymity. Which Yahoo! Answer did you like the best? Which ones are lost in translation? Let us know in the comments!